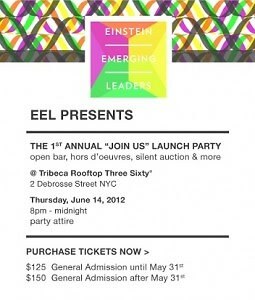 The Einstein Emerging Leaders will host its launch event on Thursday, June 14th. Held at the Tribeca Rooftop Three Sixty, the gathering will be attended by some of the city’s most influential young leaders committed to an interest in supporting health care research. Cocktail party will feature a sneak peek at the items available for bidding at the silent auction hosted on Charitybuzz.com immediately following the party. Items up for auction include two tickets to Bonnaroo, a $1,000 gift certificate to Net-A-Porter.com, a three-night stay at the Inyati Safari, four tickets to Live! with Kelly and a Raymond Weil women’s watch. Check out the online auction here! Notable attendees will include TV correspondent and former New York Giant Tiki Barber, actress Jennifer Esposito, actor Chaske Spencer and host of VH1’s Big Morning Buzz Jason Dundas. Proceeds from the event will go toward providing financial assistance to low-income families who are unable to pay for treatments at the Children’s Evaluation and Rehabilitation Center (CERC) at the Albert Einstein College of Medicine.